Pluto is fun-loving, curious, playful, and has the heart of a puppy. He’s Mickey’s very loyal pet and best pal. 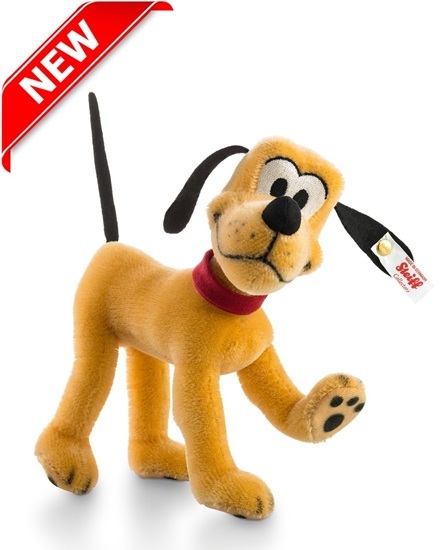 Premiering in 1930 - Pluto is fun-loving, curious, playful, and has the heart of a puppy. He’s Mickey’s very loyal pet and best pal. Pluto, also known as Pluto the Pup, is a mixed-breed dog with an enormous heart. Together with Mickey and Minnie Mouse, Donald and Daisy Duck, and Goofy, Pluto is one of the "Sensational Six" - the biggest stars in the Disney universe.Pluto appeared in 24 Mickey Mouse cartoons before receiving his very own series of shorts in 1937. He´s quite simply everyone´s favourite hound. Our Pluto is made from finest orange colored mohair and is limited to 2,000 pieces.